When popping popcorn using the traditional stovetop method there is a fine line between having too many unpopped kernels and burning the popcorn. You need to shake the pan the "correct" amount and remove the pan from the heat at the "correct" time. It usually takes someone a while to get all of these actions perfected. Fortunately, there are some wonderful products on the market designed especially for popping popcorn on the stovetop. Most of these specialty products work really well and are simple to use. Honestly, some of them are essentially foolproof. Specialty stovetop popcorn poppers provide a mechanism to stir the kernels as they pop reducing the number of unpopped kernels and eliminating burned popcorn. This is what makes them very popular with folks who like popcorn made on the stovetop. The following is our recommendation for the best way to make popcorn using the specialty stovetop method. For additional useful information on this method continue reading after the recommendation. Measure out the amount of popcorn kernels you plan to make - Most poppers recommend 1/2 cup of kernels which will make about 4 quarts of popped popcorn. Be sure that you don't put in too many kernels so that they can't be spread out on a single layer on the bottom of the popper. Put the kernels aside for the moment. Add 1-3 tablespoons of oil to the pan - The exact amount depends on how oily you like your popcorn. At a minimum there needs to be enough oil to coat the kernels when they're added to the popper. Put the popper on the burner set to Medium High - Since every stove is different you may want to experiment with a variety of heat settings to find the one that works best with your stove and popper. Drop three kernels into the popper - Swish them around to get them coated with oil and close the lid. Once these kernels pop you can move on to the next step. This assures the oil has been heated to a temperature suitable for efficient popping. Open the lid and add all of the kernels you measured earlier - Swish them around to get them coated with oil. Also be sure all the kernels are on a single layer on the bottom of your popper. Close the lid, but if possible don't "snap" it shut. All specialty poppers have vents in the lid to let the stream escape. However, they are normally relatively small so I like to leave the lid ajar to allow even more steam to escape. Start turning the crank once it starts popping - You don't need to crank this at super-sonic speeds, just keep the stirrer moving at a nice constant speed throughout the popping cycle. It's normal for the cranking to become more difficult as the popper fills with popcorn. Remove the pan from the heat - Do this once the popping slows down significantly and dump the popcorn into a serving bowl right away. Be careful when you open the lid that the steam doesn't hit you in the face. These specialty stovetop popcorn poppers have a fairly regular pan in which the popcorn pops. However, they also include a specialized lid that covers the pan but also includes a stirring apparatus. This stirring apparatus is normally a crank that is turned by the cook during the popping cycle. The crank turns a rod or bar at the bottom of the pan that moves the kernels and popped corn around the pan. 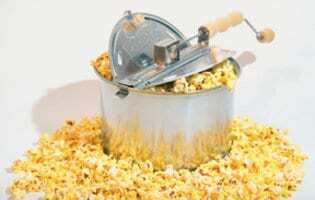 This movement reduces the number of unpopped kernels and eliminates any burned popcorn. Once you have a specialty stovetop popcorn popper, you will see how easy it is to have fresh, movie theater style popcorn in your home. You merely have to put some oil in the bottom of the pan, add the kernels and turn the crank that stirs the kernels around. These products usually recommend making popcorn on medium heat as opposed to the high heat sometimes necessary without them. It usually takes only three minutes to have a batch of wonderful and delicious popcorn. Because of the stirring apparatus on the inside and outside of the popper it is a little more difficult to clean the popper once you're done popping. Some manufacturers suggest just wiping the popper off with a paper towel after each use. Obviously, this would be a lot easier - I just can't convince myself to do it!